With a score of 12-5, it really looks like the now 1-2 OP Lacrosse team suffered a beatdown at the hands of MKA on Tuesday 4/1. However, the final score really does not say much about the game as a whole, and despite the 7 point deficit, the team really did have some great moments throughout the game. The Rams started out fairly slow through much of the first half, with MKA taking a quick 5-1 lead. Junior Matt Garibaldi took a massive slash to the head but still continued to play through the rest of the game. Once again, it seemed like a beatdown, but it was the third quarter when the team would rally and bring the game back. Coming out of halftime, the Rams came out firing on all cylinders, bringing the score all the way back to 7-5 with some key faceoff wins leading to fast break goals from Senior Andrea Fiorenza. Junior defenseman Declan Mckee had one of the best quarters out of anyone on the team, scoring several takeaways and knockdowns on his own which gave the offense more opportunities to score. 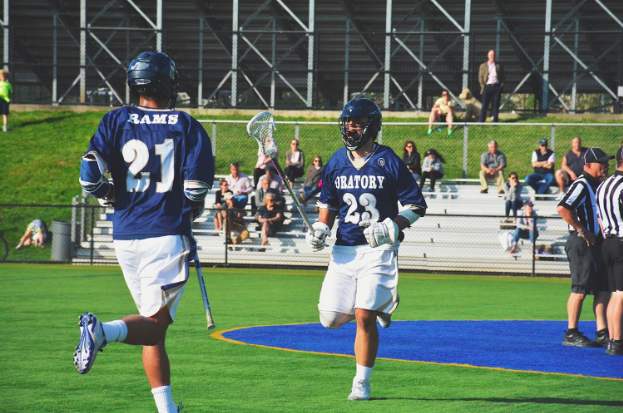 The offensive side of the field had, perhaps, its best showing all year, moving the ball quickly around and feeding the ball to the crease, such as when sophomore Brendan Kenny had a key goal right on the crease. Goalie Jack Holt also had some key saves, keeping the game very close. Overall, the third quarter shows the potential of the team and how great they can truly be. If the third quarter was like the rest of the game, the team could certainly have won. However, by the end of the third quarter, everyone began to get worn down from the incredibly physical game, and MKA only increased their lead, ending with the crushing final score. This game serves as a great learning experience for the team. It is the perfect opportunity for a confidence boost, as the third quarter shows what the team is truly capable of. All that is left now is consistency: being able to execute for the entire game. The next test for the team is Saturday, a home game against St. Joe’s, where they may have a chance to redeem themselves.